FLORENCE, S.C. – Mindy Taylor of Duke Energy is the new Chairman of the Greater Florence Chamber of Commerce, which has announced seven new board members. The changes take effect Sunday. Each new member to the Board of Directors will serve a three-year term. >> Starlee Alexander with State Farm Insurance. >> Kyle Baxter with Carolinas Hospital System. >> Annie Ham with McCall Farms. >> Brian Nunn with HealthSouth. >> Ray Reich with Florence Downtown Development Corporation. >> Marie Saleeby with McLeod Health. >> Mike Skarupa with PGBA. Rev. Merritt Graves, the pastor at Mount Zion AME Church, will become the past chairman. The chairman-elect is Ken Jackson with RE/MAX Professionals. Keith Buckhouse with NBSC remains the treasurer. >> Chad Patterson with Raldex Hospitality Group as co-chair of member services. >> Mark Buyck III with Willcox, Buyck & Williams, PA as co-chair of government affairs. >> Bret Greer with Toledo Carolina as co-chair of budget and finance. >> Bailey Dabney with the Morning News as chair of communications and marketing. >> Debbie Hyler with The School Foundation as co-chair of communications and marketing. >> Teressa Tabor with The Manor as co-chair of community and business development. Returning executive committee members are Jamie Carsten, Tyron Jones, Robby Hill, Ed Hoffman, Paul Seward and Dr. Charlene Wages. FLORENCE, S.C. — The newly constructed Chick-fil-A West Florence restaurant opened its doors for the very first time Thursday morning. One hundred people received free Chick-fil-A for a year, including dozens of campers who braved the heat, a short rain spell and the elements to camp outside the store 24 hours prior to the official opening. Blake Pate, owner and operator of the store, said that the Chick-fil-A drive-thru opened 24 years ago, and for 23 of those years, they have waited for a dining room. Pate originally took over the Chick-fil-A inside the Magnolia Mall before transitioning to the drive-thru-only one at 2705 David H. McLeod Blvd two years ago. He said that the store added 35 more jobs, bringing the total number of employment to 105 at the new restaurant. 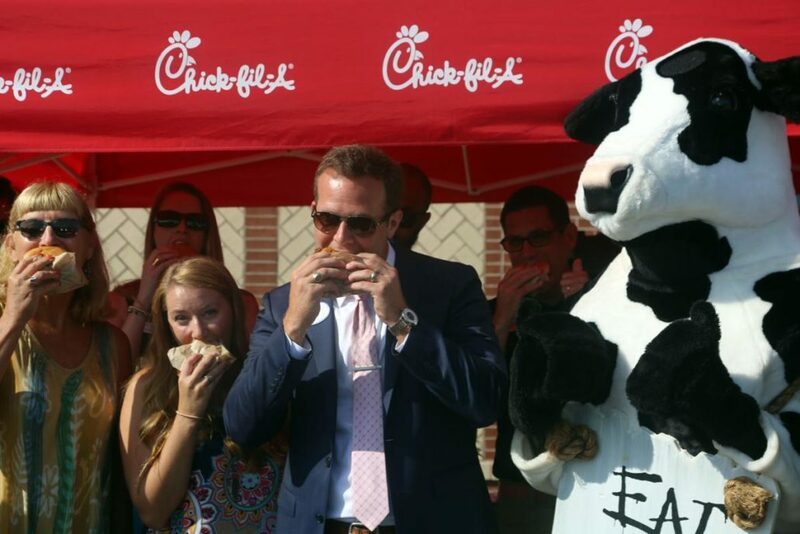 Nicole Hill, the marketing director of Chick-fil-A West Florence, said she was happy for the entire Pate family as their dream came true Thursday morning. Hill said the location right off the interstate will provide a good amount of volume for the store. Chick-fil-A West Florence will be open from 6:30 a.m. to 10 p.m. Monday through Saturday. 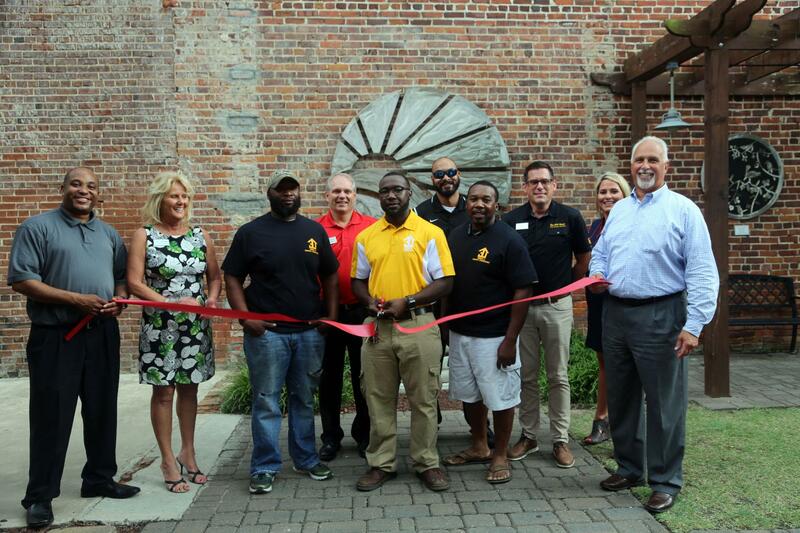 FLORENCE, S.C. – Three J Properties joined ambassadors from the Greater Florence Chamber of Commerce to hold a ribbon cutting Wednesday afternoon. Three J Properties, a maintenance and repair company, offers a variety of services for both residential and commercial properties. Joe Linder, owner of Three J Properties, said his favorite part about being a handyman is seeing his clients’ face when the job is completed. Linder said the company does anything including repairs, renovation, refinishing and remodeling for both residential and commercial properties. He said joining the chamber was a way to extend his company’s reach and let the Florence community know about the services his business offers. Linder was joined by many family members, including his brother James and father, Joe Sr., who help with the business. “I’m no better than anyone else, but I will work hard to make sure I get it right,” Linder said. “It’s awesome getting to work with my family. A lot of times, you have to choose between work and family. Through our business, we get to do both and I look forward to building relationships with people and letting them know about us in the Florence community. For more information, contact Three J Properties at 843-615-2131. 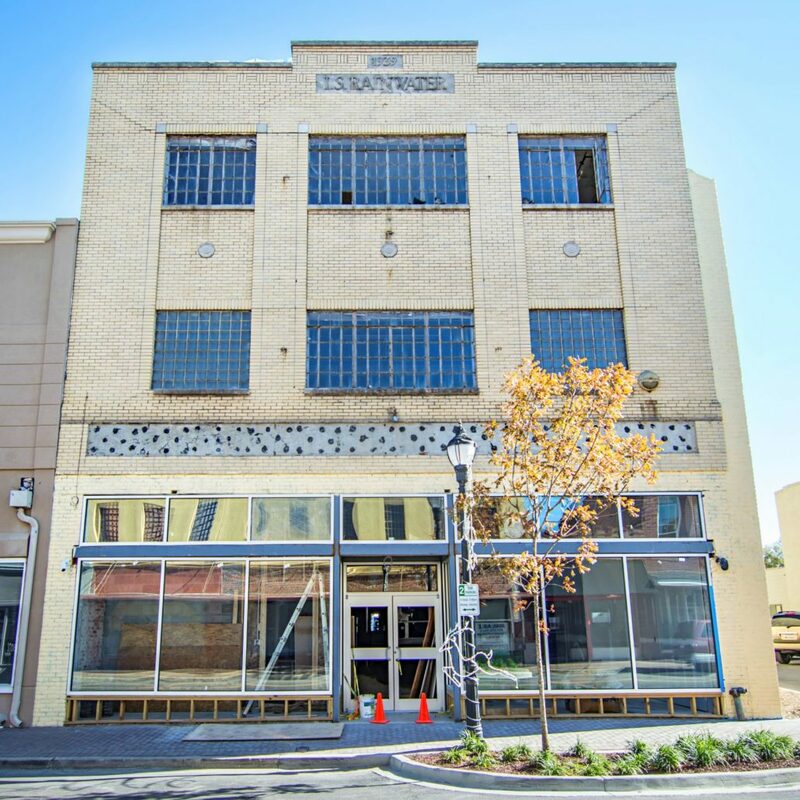 FLORENCE, S.C. – Francis Marion University’s already significant presence in downtown Florence is set to grow again. The City of Florence recently transferred ownership of the LS Rainwater Building at 142 North Dargan Street to the FMU Educational Foundation. FMU will begin work to transform the three-story structure into the new home of the Francis Marion University Kelley Center for Enterprise and Innovation and a first-floor art gallery to be curated by the FMU Department of Fine Arts with day-to-day management through the FMU Performing Arts Centers. The Kelley Center will operate a business incubator for entrepreneurs and support the city of Florence with research for business recruitment. In its expanded role, the Kelley Center will provide critical assistance for business owners in the region. The art gallery will be curated and operated by the FMU Department of Fine Arts, with day-to-day management through the FMU Performing Arts Center. The Drs. Bruce and Lee Foundation will provide funding for the renovation of the building. FMU President Fred Carter hailed yet another step in the university’s ongoing partnership with the city and with the revitalization of Florence’s downtown. The Rainwater Building will be the university’s fifth downtown facility. FMU already has completed the FMU Performing Arts Center, the Luther F. Carter Center for Health Sciences and the FMU Recording Studio. Renovation work on the Old Post Office Building, which will be used for additional classroom space by the FMU School of Health Sciences, is set to begin soon. A donation of $750,000 over a three-year period (2018, 2019, 2020) from the Drs. Bruce and Lee Foundation will allow the remaining renovations to be completed within a year. When complete, the project will reflect a $2.7 million investment into downtown Florence. The Kelley Center for Enterprise and Innovation has operated in downtown Florence since 2016, providing business incubation services, post-launch assistance, technical support and enterprise development aid to new and expanding businesses throughout the Pee Dee. The facility formally will be owned by the Francis Marion University Education Foundation and operated by FMU. The new art gallery will provide exhibition space for local artists across a spectrum of artistic disciplines to showcase their work. The gallery also will serve as another downtown event space. 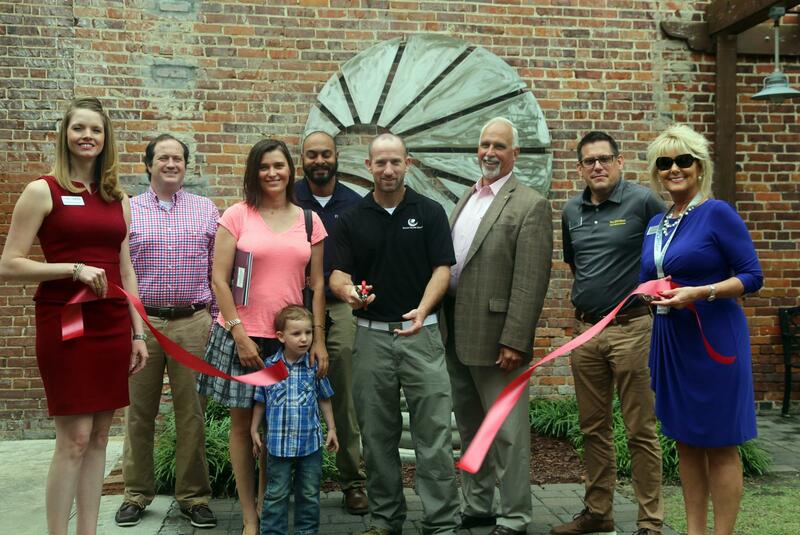 FLORENCE, S.C. — Flat Out Fencing joined ambassadors with the Greater Florence Chamber of Commerce on Wednesday morning to hold a ribbon cutting. Flat Out Fencing, a Florence-based company, does fencing of all kinds, including chain-link, wood, privacy or pickets, and gates, as well as repairs or demolition for both commercial and residential property. Nicholas Hodges, who co-owns the company with his wife, Valentina, said the company began business in September 2017. Valentina said that Nicholas is a perfectionist, which results in him making sure to put in the highest quality of work on each project he is assigned. Nicholas was referred to the Chamber by a board member, Robby Hill, and said the networking opportunities will help grow his business. He said the business is excited about its opportunities in the future and will look to provide its customers with the best quality and service. For more information, contact Flat Out Fencing at 843-206-6922 or email flatoutfencing@gmail.com. The company also has a website at flatoutfence.business.site. Participants in The Florence Chamber’s Emerging Leaders Summer Institute completed an Emerging Leaders Summit retreat at the Florence Chamber Wednesday. The program was developed and facilitated by Gina Trimarco of Pivot 10 Results. The program is designed to better acquaint leaders with our community, its opportunities and needs. Participants will develop new relationships among the participants and gain resources to help them provide continued leadership for our community. The class will resume in July for its next session. The Florence Chamber’s Leadership Florence 2018 graduation ceremony took place at 6 p.m. on May 29th at the Floyd Conference Center on the campus of Carolinas Hospital System. Leadership Florence is a comprehensive nine-month program designed to identify, cultivate and motivate new leadership for the Greater Florence area. 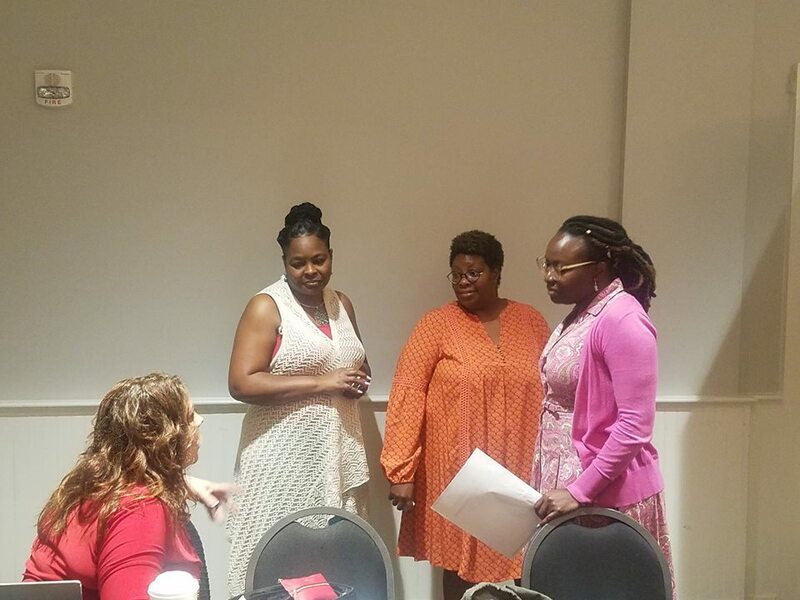 Participants increased their knowledge of the Greater Florence area, and enhanced their involvement in community activities while further developing their leadership skills. The nine-month program (one day a month from September through May) provides an in-depth look at private enterprise, government agencies, organizations, and individuals that make decisions affecting our county every day. Individuals benefit from the Leadership Florence program in several ways, including: a comprehensive understanding of important community issues and organizations, a chance to meet with community leaders, increased leadership abilities, building a diverse network of informed colleagues and expanding contacts. The 30-member graduating class held a Great Gatsby Gala earlier this month to raise money for local charities, including Lighthouse Ministries, All4Autism and House of Hope. At the graduation each of these non-profits was presented a check for $4,000. The Chambers Jr. Leadership Florence program, which consists of local high school sophomores and juniors and mirrors the Leadership Florence model, also received a check for $1,000. The graduation speaker was Carl Humphries, CEO of Hope Health. 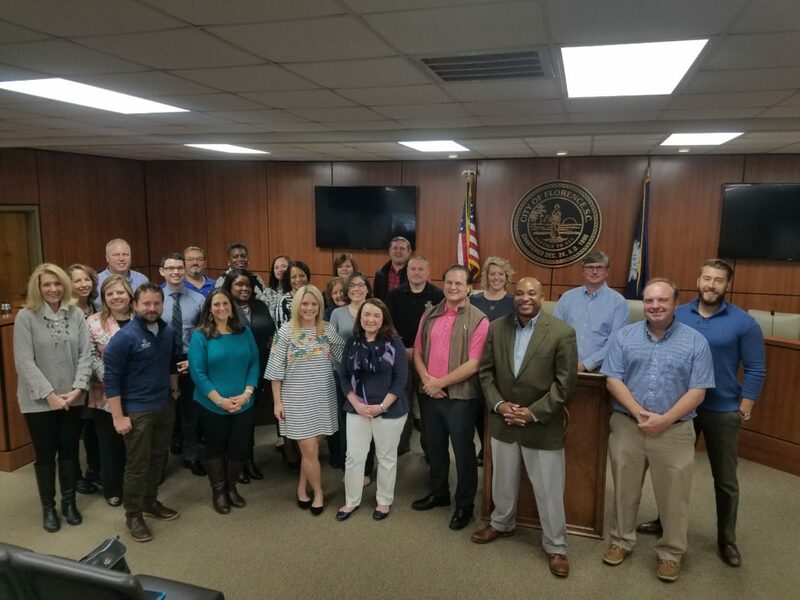 Leadership Florence Class of 2018: Aaron Robinson, Honda of South Carolina Mfg., Inc., Ali Parker, ADP, Andrea Kiester, Duke Energy, Angela K. Jacobs, Florence School District One, Barbara Merrill, Health Facilities Federal Credit Union, Brianna Dennis, Francis Marion University, Chad Collins, Florence County Sheriff’s Office, Crystal Stroud, My Realtor Group, David McBride, Florence-Darlington Technical College, David Boulware, First Reliance Bank, Hannah E. Parker, OTIS Elevator Company, Henry Duffee, Nationwide Insurance – The Hoylen Agency, Jane Comfort, Morning News, Jerry Dudley, City of Florence, Jordan Lutz, Carolina Bank, Julie Jebaily, Jebaily Properties, INC., Karen Belissary, New Generations, Kim Culberson, Florence County Economic Development Partnership, Lauren Vause, Junior League of Florence Lauren Kremidas, Edward Jones-Lauren Kremidas, Laurin Burch, Pepsi Cola of Florence LLC, Levi James, Jr, Florence County Emergency Management Department, Patrick Ford, Finklea Law Firm, Sallie Bachman, HopeHealth, Shametra Swaringer, Carolinas Hospital System, Stephen Harding, HillSouth, Todd Hightower, Carolinas Hospital System, Tracie Foster, McLeod Health, Veronica Peoples, Florence County Emergency Management Department, Zach Hearne, Signature Wealth Strategies. FLORENCE, S.C. — Starbucks officials said Wednesday that the company would be expanding its reach in Florence with a new store. The company, based in Seattle, Washington, now has three locations in Florence: one with a full-service drive-thru at W. Palmetto Street, one inside McLeod Health Hospital and one inside Target at David H. McLeod Boulevard. 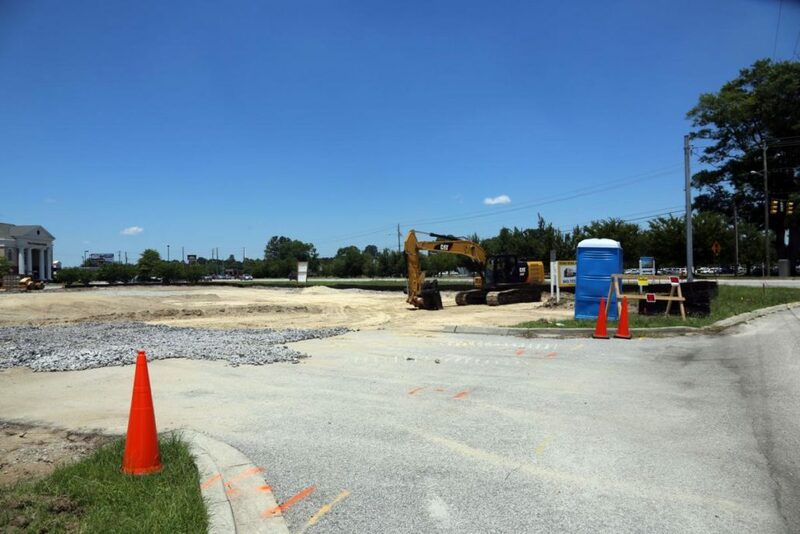 Starbucks will expand to the south side of town with a location at Pamplico Highway across the street from Carolinas Hospital. The new store will be a full-service drive-thru. The coffee shop will be part of a four-store development by the Shopping Center Group. Starbucks will take up a space of 2,274 square feet. According to records, Firehouse Subs will join Starbucks with a 1,738-square-foot spot. Two remaining spaces, one at 5,230 square feet and one at 1,392 square feet, are available for retail. “Starbucks is always looking for great locations to better meet the needs of our customers,” a Starbucks representative said. Officials said the new Starbucks plans to open this winter. On Tuesday, May 29, Starbucks closed more than 8,000 stores across the nation, including the one on West Palmetto Street, in an effort to train employees and reflect on the realities of bias in society. The decision was made after an incident in which a Starbucks manager in Philadelphia called the police a few minutes after two black men arrived at a store and sat waiting for a friend. When police were called, the men had not yet purchased anything. They were arrested after police arrived at the store. Officials said that Starbucks will be attending a meeting this summer, hosted by the Leadership Conference on Civil and Human Rights, in an effort to take the next steps toward understanding how to address other forms of bias and how companies can best implement these lessons. Starbucks offers more than 30 blends and single-origin premium coffees, fresh-brewed coffee, hot and iced espresso beverages, Frappuccino coffee and noncoffee blended beverages, such as Starbucks Refreshers beverages, smoothies and teas. FLORENCE, S.C. — Russell Christian, co-owner of Best Service Heating and Cooling Inc., pulled a marble out of his pocket with an inscription on it: “Do unto others as you would have them do unto you.” He said that was the adage his company operates by. 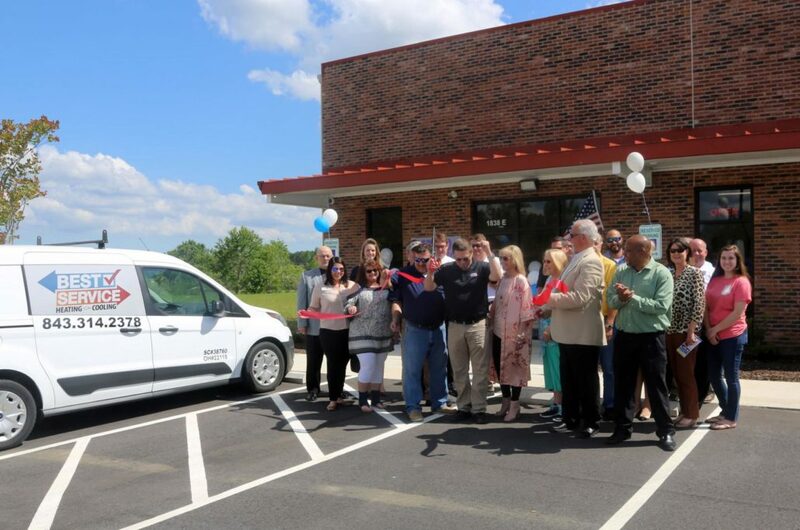 Best Service Heating and Cooling Inc., at 1838 Habersham Square, Suite E, joined ambassadors from the Greater Florence Chamber of Commerce on Tuesday afternoon to celebrate its grand opening with a ribbon cutting. Russell, who co-owns the company with his wife, Cookie, said he has operated the business for more than 40 years with a location in Columbus, Ohio. After many accolades, including BBB Accreditation in 2014 and being named a 15-time Super Service Award winner by Angie’s List, the Christians looked to expand their business to South Carolina. His wife echoed his sentiments. Leon Holden was named the operations manager for the Florence location. Russell said he believes that Leon has the knowledge and skill to perform the job effectively. Best Services Heating and Cooling Inc. provides an array of services, including furnace and air condition repair, installation, heat pump repair, duct cleaning, and more. Russell said joining the chamber was also a way for the company to become involved in the Florence community. For more information about Best Service Heating and Cooling, contact 843-314-2378 or visit its website at bestservicehvac.com. FLORENCE, S.C. – Leadership Florence celebrated the program’s 30 graduates with a ceremony on Tuesday evening at the Floyd Conference Center. 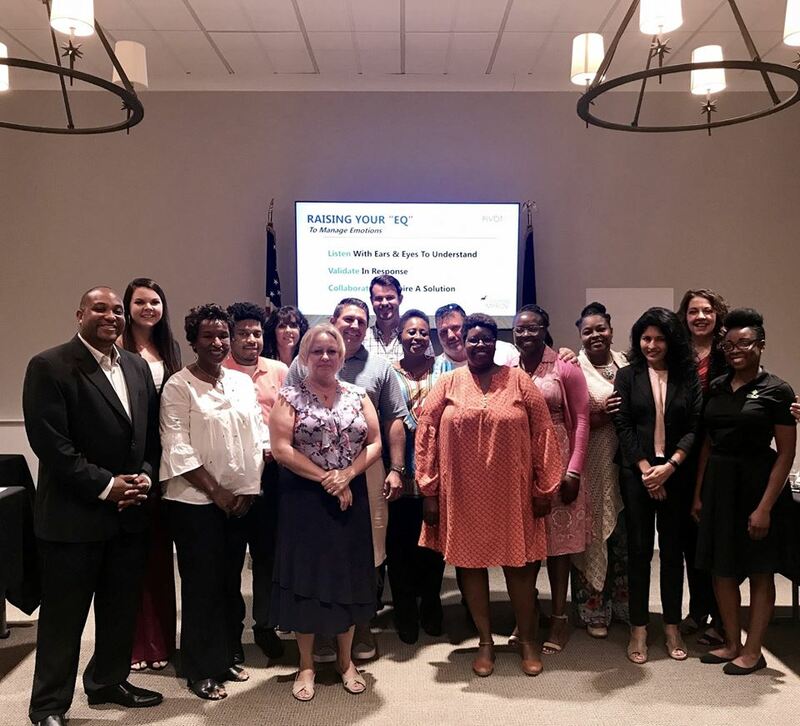 The nine-month leadership program helps build relationships among class members as well as connect participants to other leaders in the community, said Les Echols, director of community and minority enterprise at the chamber. Stephen Harding, Leadership Florence graduate and HillSouth employee, said he has lived in Florence for 30 years, but Leadership Florence exposed him to many new individuals and opportunities in the community. “It introduced me to so many new things that we have right here in our backyard that I just couldn’t believe I was blind to for that amount of time,” Harding said. Each month of the program has a different theme such as health care or government. Barbara Merrill, Leadership Florence graduate and Health Facilities Credit Union employee, said that for her Ride a Mile in my Shoes was the program’s most meaningful session. During the event, Leadership Florence participants rode public transportation. Merrill said she observed passengers who were riding a bus to stay warm or did not know if they had enough money for their next ride. “We take for granted transportation, food that we know we’re going to eat, and they’ve got to figure out how they are going to get from point A to point B,” Merrill said. Merrill and other graduates said that because of Leadership Florence they feel more aware of their community’s needs and empowered to invest in their community. This year’s Leadership Florence class held a Great Gatsby-themed ball earlier this month to raise money for several local organizations. During the Leadership Florence graduation, class officers made check presentations to House of Hope, Lighthouse Ministries, All 4 Autism and Junior Leadership Florence County. Lauren Vause, Leadership Florence graduate and Junior League of Florence member, received the Outstanding Participant Award from this year’s Leadership Florence class. Each year, class members vote on who they think should receive the award. To date, more than 1,000 people have completed the Leadership Florence program. Mike Miller, chamber president, said participants usually begin the program with hesitancy but end with lasting professional relationships. Carl Humphries, CEO of HopeHealth, was the graduation speaker. Humphries participated in Leadership Florence during the 2002-03 program. He attributed much of the expansion of HopeHealth to the relationships he made through Leadership Florence.